Click here to register for our webinar with complete results from the new study, Moms on the Mother Load, this Thursday, November 29 at 2pm EST. This past August, Edison Research conducted an online national survey of 516 moms of children age 21 and under and asked them to indicate who does what in their household, how they feel about their responsibilities, and how much confidence they have in their child’s other parent to handle these tasks. The survey covers not just the workload of parenting and home responsibilities but also the mental load that is required to manage a household. From planning birthday parties to making doctor appointments, find out what U.S. moms say they are responsible for, what their co-parents are responsible for, and how they feel they are handling it all. Click here to register for our upcoming webinar with the complete results from this study, Moms on the Motherload, Thursday, November 29 at 2pm EST. This past August, Edison Research conducted an online national survey of 750 parents of children age 21 and under and asked them to indicate who does what in their household, how they feel about their responsibilities, and how much confidence they have in their child’s other parent to handle these tasks. 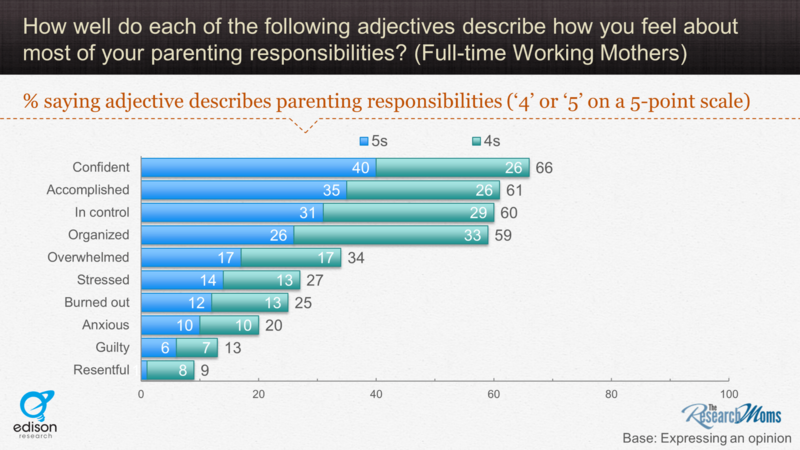 The survey was asked among all mothers and fathers, but for the purpose of the Working Mother WorkBeyond Summit panel, we looked at the data among full-time working parents, or parents who work 35 hours or more in a typical week. 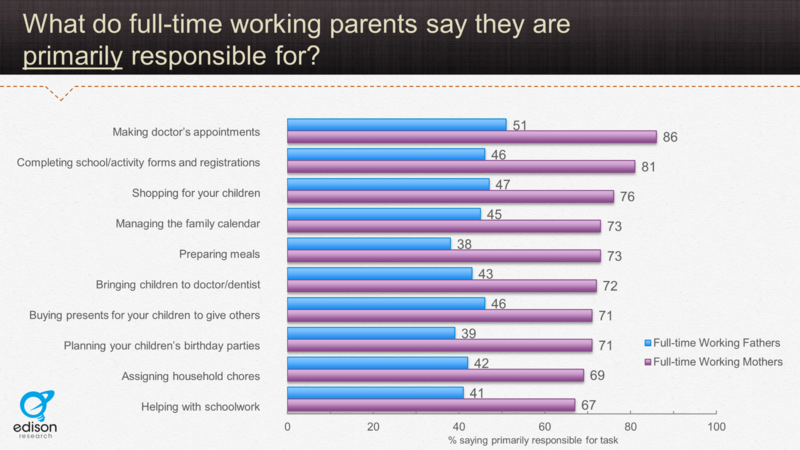 We asked respondents a long list of parenting tasks and had them indicate who is primarily responsible for each one – either they are, someone else is, or they share the task evenly with someone else. The data revealed that most full-time working mothers are primarily responsible for the vast majority of the tasks involving their children, such as making their kids’ doctors appointments, filling out school forms, or going shopping for their kids. All these “invisible” tasks that working mothers are doing is also referred to as the “third shift.” Working mothers spend the first shift at the office, the second shift doing household chores, and the last shift planning and organizing for their family. 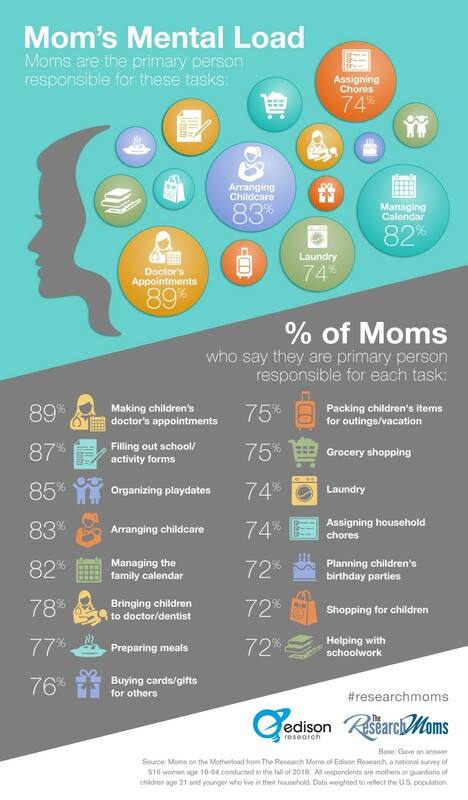 When asked about the overall division of parenting tasks in their household, 81% of full-time working moms said they handle at least the majority of these tasks, with 27% saying they do all of the tasks. When we compared this data to mothers who are not currently employed, we were surprised to discover that it was exactly the same. Most moms are the “default” parent, whether they work or not. So, we know what full-time working moms are doing but how do they feel about this mental load? It’s easy to assume that juggling home, work and family would cause these working mothers to combust, but they’re not! Among full-time working mothers, 66% say they feel confident about their parenting tasks, 60% in control and 59% organized. Among the negative adjectives, “overwhelmed” was the one that resonated most with these working mothers – with a third of working moms saying they felt that way. Yes, working moms are carrying the mental load, but no, they aren’t necessarily overwhelmed by it. Organizing your daughter’s 5th birthday party. Scheduling your son’s annual physical exam around soccer practice and band rehearsals. Remembering that Tuesday is Picture Day and Wednesday is the plant sale at school. These are just some examples of the mental load, or the behind-the-scenes strategizing that is needed to keep a family running. While household chores are becoming increasingly shared by Mom and Dad, the day-to-day planning, thinking, and organizing of parenting still very much belongs to Mom. Research Mom Nicole Beniamini will be discussing the mental load of moms at the Working Mother: WorkBeyond Summit on October 8, 2018 in NYC. Nicole will be joining the research panel, “How the Best Companies are Staying in the Game,” where panelists will discuss the challenges of working parents and how companies can address these considerations in order to retain employees. For more about moms’ mental load, join The Research Moms from Edison Research as they present the findings from their latest study, “Moms on the MotherLoad” on Thursday, November 29th, at 2 PM Eastern. This study highlights all new data about what’s on Mom’s to-think list, how she feels about her parenting tasks, and why she might be hesitant to delegate to someone else. The Research Moms are Edison Research’s team of experienced researchers who also happen to be moms. Combining a solid platform of market research with real life insight, they are a unique resource for analyzing habits, behaviors and trends among moms. Click the image below to learn more about The Research Moms! The Research Moms are a group of experienced researchers with a specialization in understanding today’s moms. Combining a solid platform of market research with real life insight, they are a unique resource for analyzing habits, behaviors and trends among moms. Pooling their research talents from the different branches of Edison Research, they are equipped for both quantitative and qualitative studies. To learn more about how The Research Moms can put their insights to work for you, click here to email them.